In the smart bike trainers market, wheel-on and direct drive smart trainers have been the choice for many cyclists. They are easy to setup, ride and can get the job done without having to worry about falling off the bike. However, these bike trainers lack the real feeling of riding a bike. Many companies tried to improve that by introducing bigger and more precision balanced fly wheel to better simulate real world inertia. And some companies went as far as simulating the surface of the road and down hills. However, all these advanced trainers still lack the ability to make your bike move with you like it does on the road. Rollers came very close to that by allowing a rider basically just ride their bike and try to balance the bike just like you do when riding outdoors. However, many cyclists and triathletes avoid rollers because they are harder to ride and require smoother pedaling and a lot more concentration, otherwise you will end up falling off and possibly injuring yourself. InsideRide wanted to change that with their E-Motion rollers. 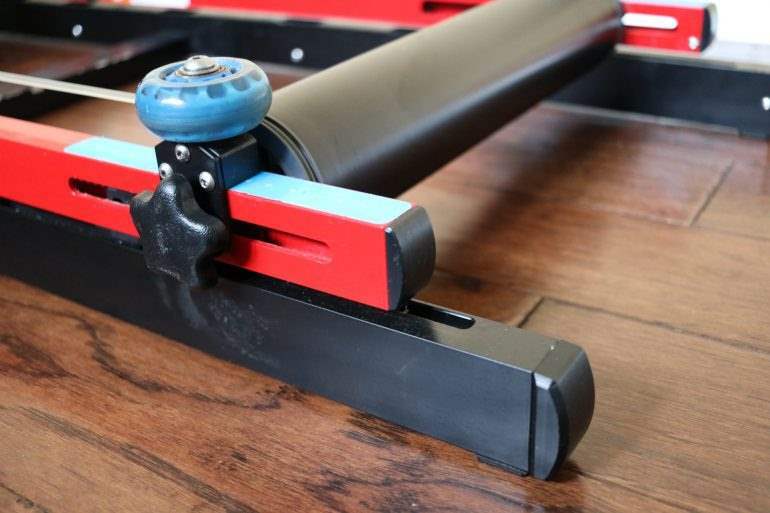 The E-Motion rollers is priced at $900 as a stand alone roller (manual) or $1,200 with the smart resistance controlled unit. With the smart resistance, the E-Motion is priced in the same ballpark as top of the line direct drive smart trainers such as Wahoo KICKR and CycleOps Hammer. I purchased the E-Motion and the resistance unit myself and this review isn’t influenced by a sponsorship or any type of promotion. 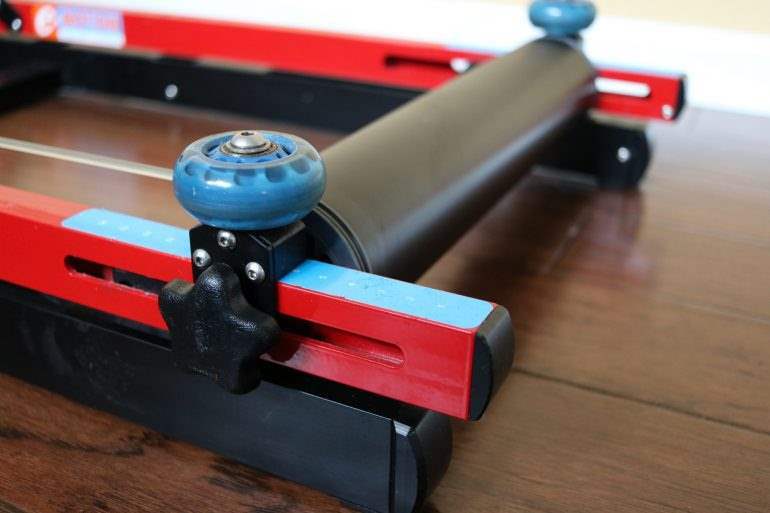 What makes the E-Motion rollers different is the patented “free motion” technology base. The rollers will move with you making riding and standing a lot easier than conventional rollers. When you are riding outdoors, your bike is moving with you and shifts back and forth and the E-Motion rollers try to simulate that same motion. That’s why you will notice that riding the E-Motion is the closest thing to riding your bike outdoors. The other main feature that sets it from other rollers is the front bump wheels. These are two wheels that look like roller blades wheels placed on the side of the front drums to prevent you from riding off the rollers. According to Inside Ride, “It’s not possible to ride off the drums. You can try as hard as you want and it won’t happen”. That doesn’t mean you can’t tip over which I managed to do few times. 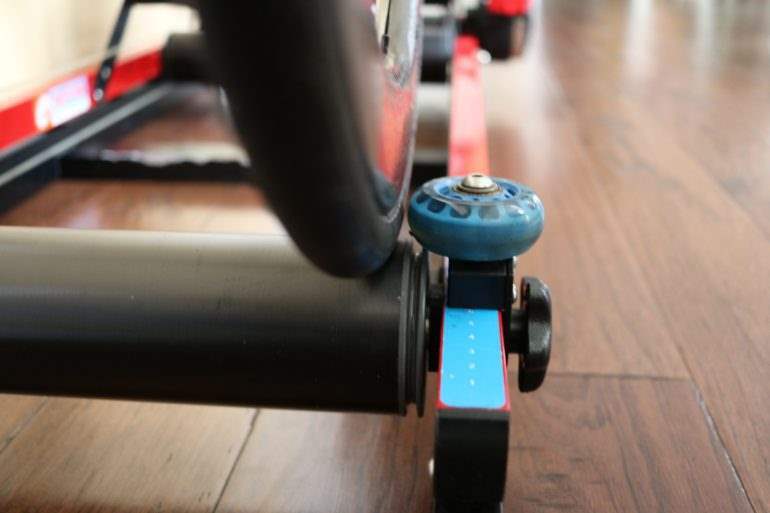 Similar to conventional rollers, you still need to learn to balance yourself, however, because the E-Motion is not fixed to the base due to the “free motion” technology and front bump wheels, you just need to learn to trust it. It took me few rides until I started feeling very comfortable on it. In fact, it is my main trainer that I use for most of my rides for the past five years. Additionally, the E-Motion has two bumpers to hold the rear wheel in place and prevent the bike from lunging forward when getting up for a sprint. 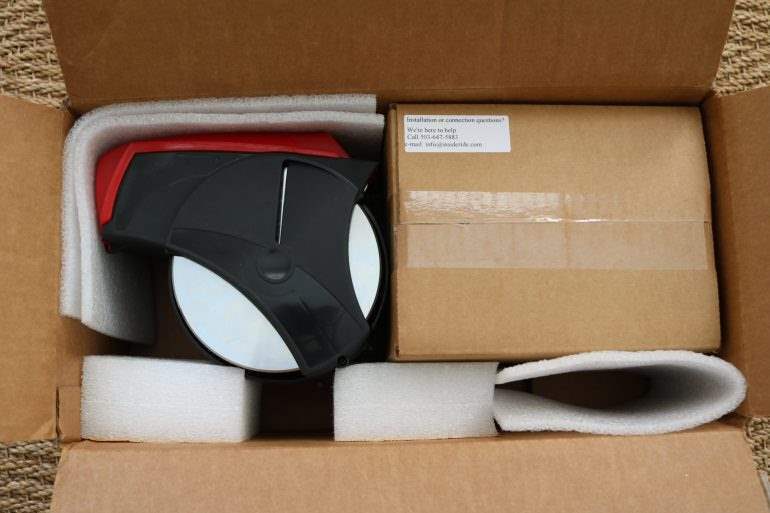 If you purchase the smart resistance unit separate as an add-on to upgrade your current E-Motion, then it will come in its own box and you will have to assemble it. 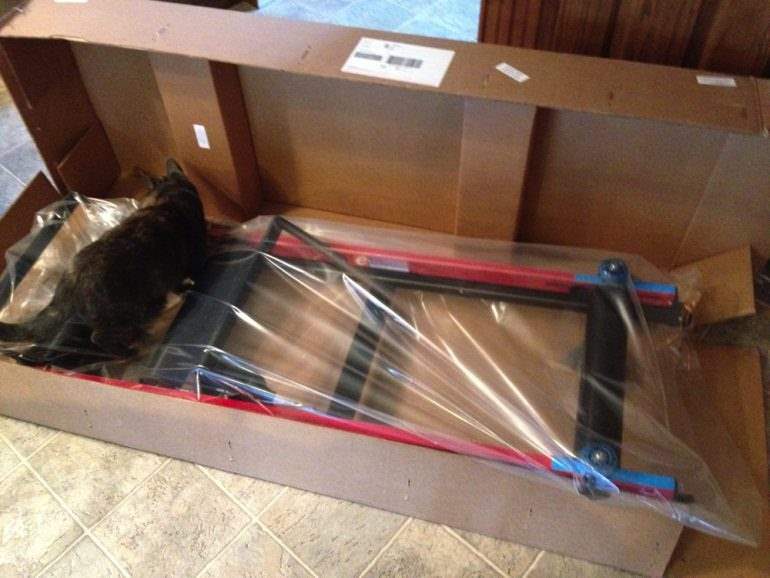 The assembly is simple and you will find full instructions included. An ANT+ key is also included with the smart resistance unit. InsideRide tried to build a smart resistance unit for a few years now. Their original attempt came to a halt because of “compatibility issues”, according to the company and the project was canceled. You can read all about it here. 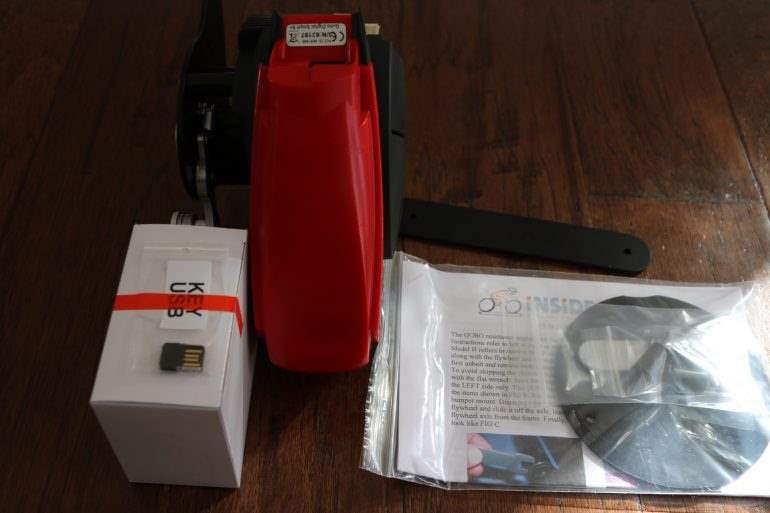 Instead, InsideRide decided to use Elite’s Resistance unit made for their Qubo Digital B+ trainers and modified them mechanically into a belt drive so they can be mounted on the rollers. So don’t freak out when you get the unit and realize it look exactly like the Elite’s resistance unit. If you purchase the E-Motion with the resistance unit installed, then all you need to do is unbox it, adjust the front drums to fit your bike and proceed to the calibration process. If you purchase the resistance unit as an add-on to your current E-Motion, just follow the installation instructions in the manual and you should be up and running in less than 30-minutes. Basically, you need to remove the current resistance and install the new resistance unit on the opposite side of the rollers. 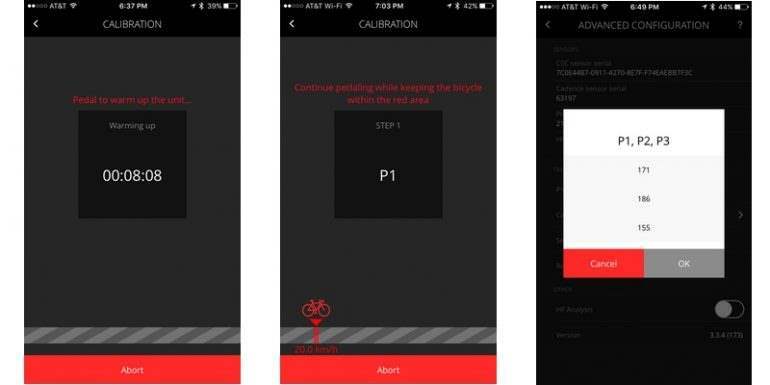 The calibration is done using the Elite myETraining app which is available for iOS and Android smartphones and tablets. There are two different levels of the calibration process and the one you use depends on your desired level of accuracy. The advanced calibration requires your own power meter to take 3 wattage readings at prescribed resistance levels and then write the values to the unit. The Elite myETraining app will do this for you automatically. 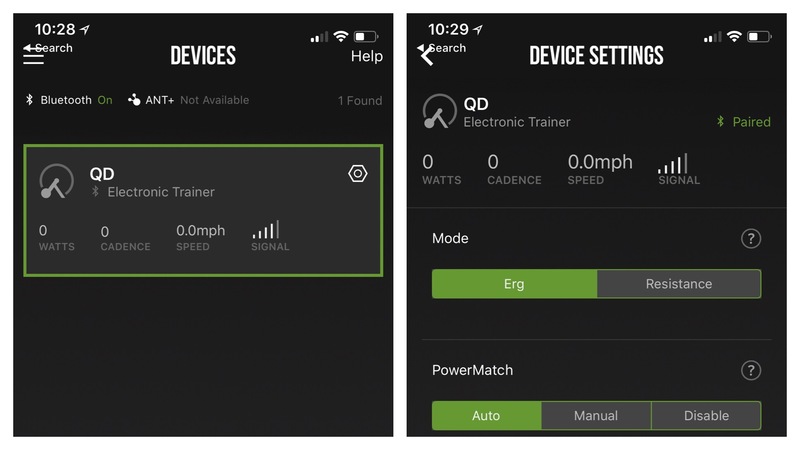 All you need is your power meter paired to your phone or tablet and your InsideRide E-Motion paired as “Qubo Digital Smart B+” trainer in the app. Once everything is paired, then you will go through the calibration process. First, you need to pedal for 10 minutes, then the app will adjust resistance and fill out the values for P1, P2, and P3 for you. A little friendly warning: The first part of the calibration (P1) will increase resistance all the way. Be ready and try not to fall off the rollers. The second method is by using the quick calibration method. You just need to email InsideRide and they will send you a spreadsheet. Or you can send them the device id and they will send you back the default settings for your unit. To do a quick calibration, start by riding the rollers smoothly at 25mph with zero resistance and take a wattage reading with your power meter. Enter that value into the “new values” in the P3 column in the spreadsheet. The calculator will then generate new P1 and P2 values. If you do not have a power meter, you can simply enter your current values into the calculator and then enter a new P3 value (which is 20-30 watts larger or smaller than the current P3). Then let the spreadsheet calculate the new P1 and P2 values. It’s really not as hard as it sounds. The most difficult part about this whole thing is using and navigating the Elite app. Now done with calibration and onto riding the rollers. I have been using my InsideRide for over five years now and the new smart resistance unit for the past month. The Qubo max slope is 6% but on the rollers you automatically gain another 2% due to natural rolling resistance, so the max slope is about 8%. I have used the E-Motion with TrainerRoad and Zwift. The pairing process was simple and I had no issues pairing it with either app. With Zwift, I have used the rollers for a free ride and a structured workout. Free riding on Zwift, the trainer responded to changes in slope very well. However, don’t expect the rollers to match slopes above 8%. After that, you can adjust your gear to increase resistance if you want to make the climbs harder. On hard resistance of climbs, similar to wheel-on trainers, you might experience some tire slippage. You can try to eliminate that by keeping tire pressure low or possibly try specific trainer tires like the Kinetic or Cycleops ones to improve grib on the rollers. As for accuracy, please note that I ran the calibration against my power meter. However, the resistance unit still does not know your actual power and rely on virtual power. However, with a good calibration, that virtual power will come very close to your real power numbers. Now you probably wonder why does the power you get from the resistance unit important if you have your own power meter. Will, it might not matter if you just free ride or like to adjust resistance manually. But if you like to use ERG mode for your structured workouts, then it does matter. Zwift does require you to pair your trainer as the power source to enable ERG mode. TrainerRoad, on the other hand, does not. So here is another ride I did using ERG mode with some longer intervals at tempo. You will notice that InsideRide numbers are basically a straight line. This is because the trainer will just broadcast your target numbers and not your real numbers. This is the case using TrainerRoad and Zwift Workout. Looking at the results in the table below, my actual power came almost spot on to my target power. This goes back to my point earlier about making sure the trainer is properly calibrated if you like to use ERG mode. the E-Motion isn’t your quietest trainer out there. It can be a bit loud, but not too loud to wake anyone up in the house and no one complained about the noise for the past 5-years. The noise level is similar to a quiet wheel-on trainer x2. 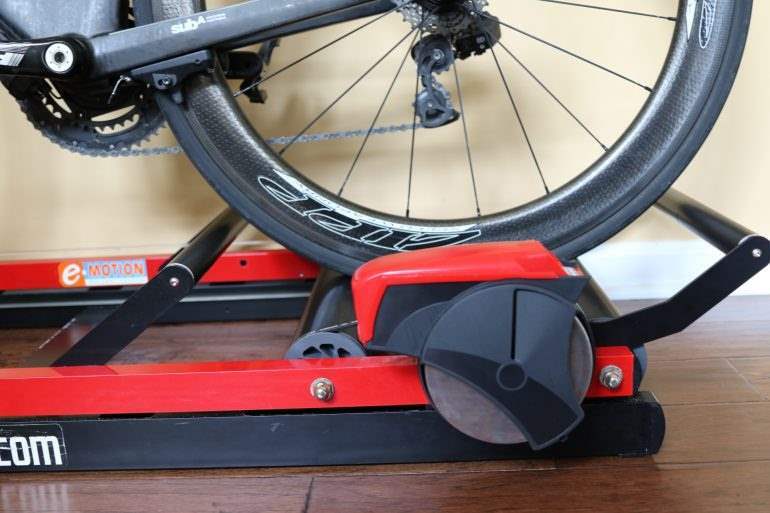 The reason for louder noise coming from the rollers is because unlike a wheel-on trainer with only the rear wheel spinning, you have two wheels rolling on two drums. There is also some noise coming from the resistance unit when you go at a faster speed with lower resistance. That noise seems to go away with lower speed or more resistance. The E-Motion and the smart resistance unit is available as of today and can be purchased directly from IndiseRide for $1,200 with the resistance unit. You can also purchase it directly from Amazon. The resistance may max out to a simulated real world of 8% but on Zwift there is a big difference in the amount of resistance being applied when you hit a hill which Zwift is showing at a grade of 8% vs say a 14%+. On a 14% grade in Zwift you are grinding so any more resistance and I wouldn’t be surprised if people started having issues keeping upright. As a note in Zwift’s settings you can adj. the intensity level of resistance under settings. Regarding noise level I find the unit very quiet once over 175+ watts, lower than that I find you start to get a little bit of squeaking coming off the belt. I’ve had no issue with wheel slippage while seated at max resistance. If I stand while at max resistance though I have noticed a little; not too bad at all though. I’m running stock rubber at 100 PSI. 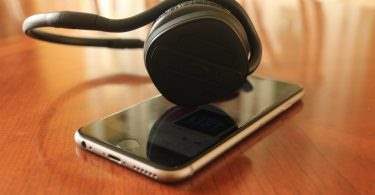 All in all I have been very happy with the smart resistance add-on; the experience has become so immersive. I modified my rollers to keep the original wireless resistance unit in place. This required moving the front drum drive belt up onto the drums. This setup allows me to keep adding resistance once the “smart” resistance unit reaches it’s max resistance. This comes in handy on the Zwift Watopia mountain heading up to the tower. The drum belt being up on the drums doesn’t seem to be an issue. It just stays right where you put it. I also added larger roller blade wheels/bumpers so that the belt would be covered by the bumper so that it can’t be run over by the bike. Randall, that’s genius! Will give it a try. Don’t need the additional resistance but would love the additional flywheel to give it a better road feel. Have you found a way to keep the rear wheel from rubbing the new resistance unit on the left side? That’s the only issue I’ve seen with the system. I have not had any issue with back wheel rubbing the resistance unit. Even if it did there is a protective hard cover which the tire will hit and bounce off of. So no damage to the unit. Really if you think about it, it is pretty hard to do with normal use. You pretty much need to ride with the front wheel up against the front left safety rollers and then lean left. At which point you are going to be high siding off the rollers. Hi Tariq – Thank you for an excellent analysis of the Inside Ride rollers with the Elite Qubo resistance unit. After reading your review in the early summer, I purchased the rollers with the Qubo, and I’ve been using them for about 3 months. Early on, I used only Elite’s app for workouts, but about 2 months ago I started using Zwift. Linking to Zwift was easy, and I’ve logged close to 750 miles so far. But one problem I’m having I wanted to ask you about. There is a very noticeable clicking noise coming from the Qubo that is almost constant. This happens on flats, and also when I climb on Zwift. I’ve tried sliding the resistance bar in the Zwift settings, and no matter where I set that bar, I still have the clicking. I weigh 152 pounds, and my unit was shipped with the following P values, which I have not changed. 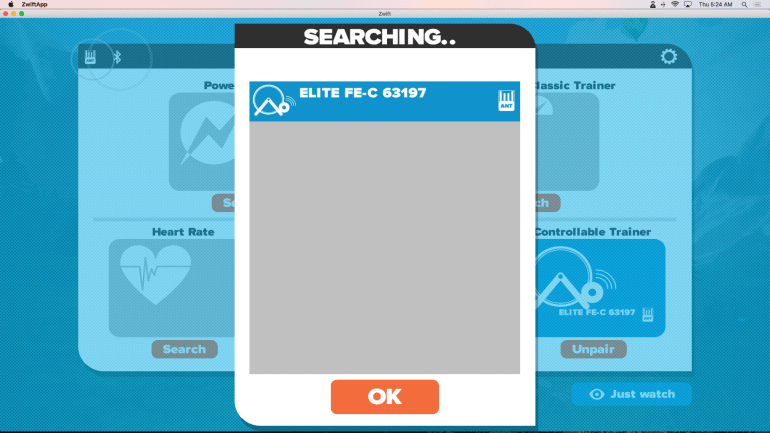 Today I warmed up, and rode with Elite’s app for a few minutes. I had it set to no resistance and I got 325-330 watts to ride at 40kph, so it seems that the calibration is spot-on with the P3 value. Have you ever experienced this clicking? If so, have you found a solution? I haven’t experienced any clicking sound from the unit. You might want to reach out to InsideRide support and hopefully they can help you out. I really love the emotion and been using mine for over five years. However they are loud. A little Louder than the kickr 2. Probably as loud as the kickr 1. The only reason I havent recently been on mine is because I usually train super early in the morning when everyone is sleeping and don’t want to wake the family up. But if you can tolerate some noise, I would go for it. Just a quick one, been struggling to find a definitive answer to this … is it possible to control the trainer via Bluetooth? In your review you mention smart resistance is ant only, but then just after have a screenshot of your Apple TV connecting to it as a controllable trainer? Great review tho – thank you! Sorry for the confusion. Earlier, most apps only supported the trainer control via ANT+. Now Zwift and TrainerRoad both support controlling the trainer via Bluetooth as well. I ran into issues last week using Bluetooth on Apple TV Zwift. getting the QUBO to work with apple TV in Bluetooth. Was working perfect for month. Was still using my on-bike power meter to send power data to Zwift and using the QUBO for resistance changes with Zwift terrain changes. So here’s the issue. Looks as if the unit now gets stuck at a higher resistance every time I log on and pair it in Zwift via Bluetooth. Apple TV only does Bluetooth. Now when pairing, as soon as the Qubo syncs with Zwift it shoots up to about 8/16 (I can hear the motor move to what I assume is about half way up the range). So that means that the baseline is no longer 1, it’s now 8, so when Zwift adds resistance it quickly shoots up to 10/16 – 13/16 which is unusable. I wonder if this has to do with the latest Zwift update. I would reach out to InsideRide and see what they say. I will see if I can jump on mine and try it out. I borrowed a friend’s InsideRide with the old adjustable resistance unit (remote is a car-starter fob). I liked it, but I can’t justify the $1200 price. Have you ever tried the Elite Arion Digital Smart rollers? For half the price, you lose the floating frame and side wheels, but I think that is it. I am strongly considering that option, but wondered if you had any comments. Thanks! I haven’t tested the Elite Arion rollers yet.I will see if I can get my hands on some smart rollers to test. Before buying the Inside Ride Rollers, I had the Arion Digital Smart B+, and I was not happy with them. The first problem was that the roller drums were not perfectly round and this produced a very noticeable vibration while riding, that got worse as speed increased. Elite replaced one of the drums but I was never able to get rid of the vibration. In addition, when I replaced the drum I got to see how cheaply made the drums and bearings were. Once I saw this, I really felt that the Arion rollers were way overpriced and not a product that would last a long time. Plastic frame, plastic drums, cheap bearings but a very good myEtraining app and computer interface. But my experience is likely not typical. If you do buy a set, make sure to keep the box and get a good return policy. I realize this is an older article, but what trainer are you selecting in Zwift to connect? I noticed in your pairing screenshot that you are showing “Elite FE-C 63197”. Is that what you are using or “Unknown Rollers”? Is there any difference with connecting with an Apple TV now with the new smart resistance unit that uses Bluetooth FTMS? I believe the last time I tried connecting, it was coming up as QB something in the connection screen but definitely not “unknown trainer”. Zwift doesn’t support FTMS for cycling yet. I’ve used the QB unit with Zwift on Apple TV without issues. I haven’t had a chance to test the new resistance unit they recently released yet. Tariq, thank you for your help! I’m looking to purchase the InsideRide Emotion Rollers with the new (2018) Smart Resistance ANT+/Bluetooth FTMS. So I can’t connect with this then? Sorry about the dumb questions but I’m new to all of this. I thought I would be able to connect via Bluetooth to my iPhone using the companion app then just signing into Zwift on my Apple TV. 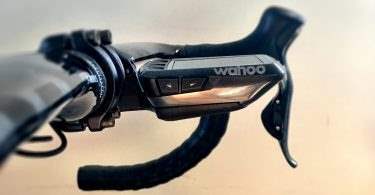 I do not own a separate head unit (like a Garmin or Wahoo Element). I do own a Wahoo TIKR (HR monitor) and Wahoo Cadence sensor that connected via the companion app when I tested Zwift on my Apple TV. Do you know how (if possible) I could connect the E-Motion Roller? What would you recommend? 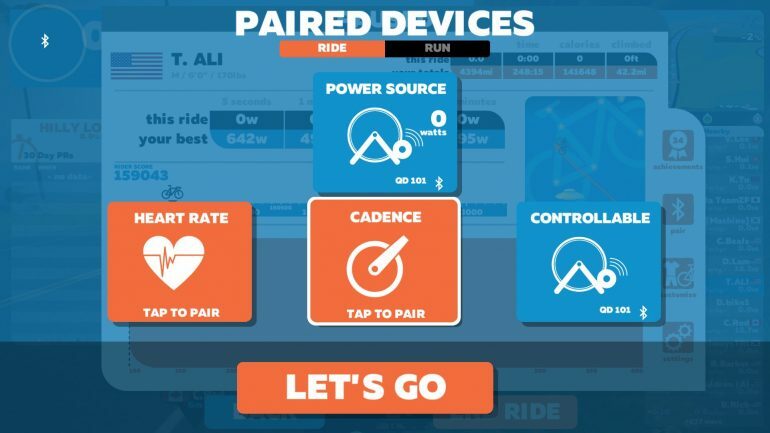 According to InsideRide, the new smart control unit is compatible with Zwift and honestly, I don’t see any reason why it wouldn’t be regardless of Zwift FTMS compatibility. Being FTMS compatible means the unit is compatible with many other apps that support the FTMS protocols such as the Sufferfest and TrainerRoad. As for Zwift on Apple TV, you shouldn’t have any issues using it with the Apple TV. Tariq, you’re my hero! Thank you. Larry from InsideRide told me to check to make sure when I sent an email to ask about connecting to Zwift. 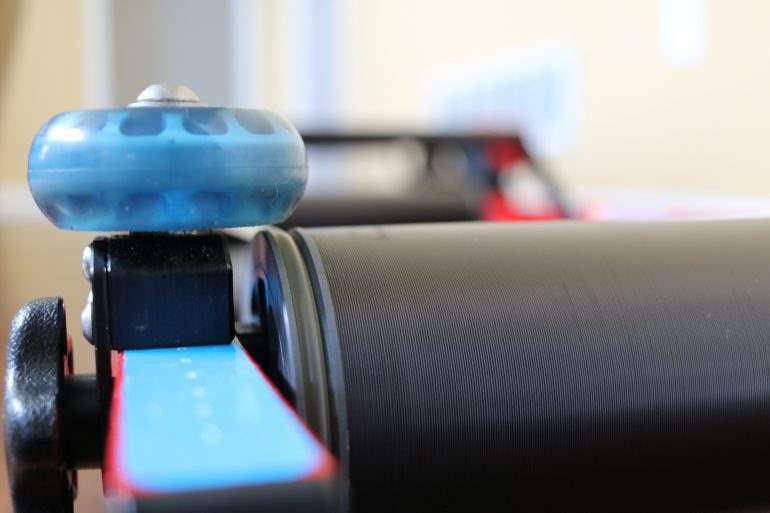 So did InsideRide use older Bluetooth technology on the Rollers you tested in this article? I assume you also connected via Bluetooth? Sorry, I miss understood your question earlier. The unit tested in this review has the Qubo resistance unit which works with Zwift via Bluetooth ok. I would think InsideRide should be able to answer your question directly. I just checked their site and they only have FTMS listed with the new unit. This makes it compatible with TrainerRoad and Sufferfest via Bluetooth but unfortunately, Zwift doesn’t support FTMS for cycling as of yet. However, they do support it for running but that doesn’t help you. So my guess is FTMS support for cycling should be coming soon. I would still get it if that’s what you want and worse case scenario is you will have to wait for few months until Zwift releases FTMS support.